Not even the strongest of us can lift a car. Floor jacks are the perfect solution to provide elevation, stability, and strength to your vehicle during regular maintenance and repairs of your automobile. Having an appropriate floor jack can make your repairs go smoothly when fixing you trucks, cars, and SUVs. The Powerzone aluminum and steel garage jack manufactured by Milestone Tools is one of the high rated floor jacks on the market. Made in China, the floor jack can be trusted and relied on when lifting your car, SUVs, trucks and larger vehicles during repairs and regular maintenance. The Powerzone 3-ton jack has become popular in the market, with most customers preferring it due to the high-quality aluminum and steel used during construction. The jack minimum lift range makes it accessible to lower vehicles while the jack system efficiently raises load quickly. It comes with an instructional manual and a safety valve that ensures the tool never overload beyond its capacity. The Powerzone features ensure you get top-quality service during your car maintenance. The floor jack weighs 59.1 pounds that can be used to lift any car with a dual pump handle that needs few pumps to raise the vehicle from the ground level. The aluminum and steel jack provides the perfect combination of speed, force, and durability. Many other incredible features make this heavy duty jack stand out. The jack is easy to store when not in use, the swivel is smooth to position even on a rough surface and has the ability for height adjustment during usage. While some customers were cautious, the product stands out and has received an average 4.5 customer star rating. Quite simple and easy to use, the Powerzone 380044 3 Ton Aluminum and Steel Garage Jack provides value for money spent. 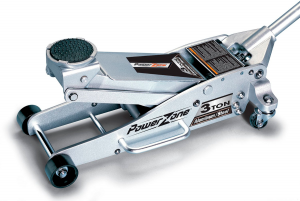 If you are in the market for a high-quality garage floor jack at a budget-friendly price, then the Powerzone 380044 3 ton aluminum and steel garage jack should be your number one pick. The garage jack is an excellent all-around performing low profile floor jack that has massive power and speed with a one year warranty. The lightweight jack has a protective rubber padding built with safety overload mechanism to protect and add caution you during usage. The garage jack is the best you can get for your car. Thanks for reading as we hope you make the best choice.